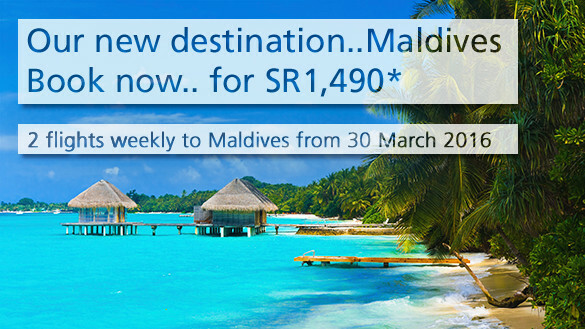 Official flights from Saudi Arabia to the Maldives commenced today. The first flight of Saudi Arabian Airlines also known as Saudia, a Boeing (B777-300ER) landed at Ibrahim Nasir International Airport (Hulhulé – Malé) at 9.00 am Maldives local time. This inaugural flight was welcomed with a water salute and the passengers were greeted with the Maldivian traditional “Bodu Beru” item. The national carrier will operate two weekly flights to and from the islands, from Riyadh (RUH) to Colombo (CMB) and then Malé (MLE – Ibrahim Nasir International Airport). On this celebratory occasion, Saudia offers fifty percent discount for tickets to Saudi Arabia, Europe and the United States. At the welcoming reception Mr Ibrahim Faisal Chairman of the Civil Aviation Authority of Maldives and other senior officials met with the senior delegation of Saudia. Speaking at the ceremony, Director General of Saudia Saleh Al Jassar said that with the commencement of direct flights the relations between the two brotherly nations will be further strengthened. He noted that during the reign of King Salman the relations that existed between Saudi Arabia and Maldives has become more closer. Since there are a lot of tourists wanting to visit the Maldives from Saudi Arabia the flights will enable more people to travel to the Maldives and strengthen cultural relations. Ambassador of Saudi Arabia to the Maldives, Badr bin Ali bin Ahmed Kahill said that it would strengthen the growing relations between the the two countries and will open broad prospects for the development of economic relations and trade exchange.